In the Post-PC era, organizations are increasing facing the pressure to choose between serving the needs of the user to be productive, versus IT’s need to ensure overall safety of information. Productivity and safety have fundamentally been at odds for a very long time. However, if organizations are able to achieve the right balance of catering to the needs of the user and IT, great transformations occur. These transformations occur not only in business and IT, but also in individuals to drive great outcomes. Additionally, user work patterns and expectations are changing very dramatically. Today’s user expects instant access to any information regardless of where they are, or which device they are using. They also have little tolerance for poor user experiences. They want to be able to share the information with others within and across firewalls. Organizations are becoming artificial boundaries. Lastly, it is far too expensive for IT to move content from different repositories into yet another centralized repository when a new way to work comes about via a technology innovation. Instead, information is expected to have a distributed characteristic, but access patterns, governance, management and policy enforcement should evolve based on new work patterns. The question we as a business community are faced with is whether we should accept the imperfect world where such an artificial choice is forced upon us, or reject the status quo of mutual exclusivity between two very significant necessities for a business to be successful. When we look closer at the key defining traits important for productivity and safety in a trusted enterprise, a few aspects are amplified. Let’s consider each of the two dimensions more carefully. Mobility: Ensure users have freedom to choose their devices, and access the right information from anywhere, at any time on any device. Delighting The New User: Deliver a user experience that is completely intuitive, frictionless, efficient and just works the way one would expect it to! Ensuring Collaboration and Transparency Across Boundaries: Whether it be geographical boundaries, device boundaries, infrastructure boundaries or organizational boundaries, people should have the option of full transparency and engagement to get their job done in the most effective ways. Security: It isn’t just who has access to what information, but also having access to the right information at the right location in the right context. 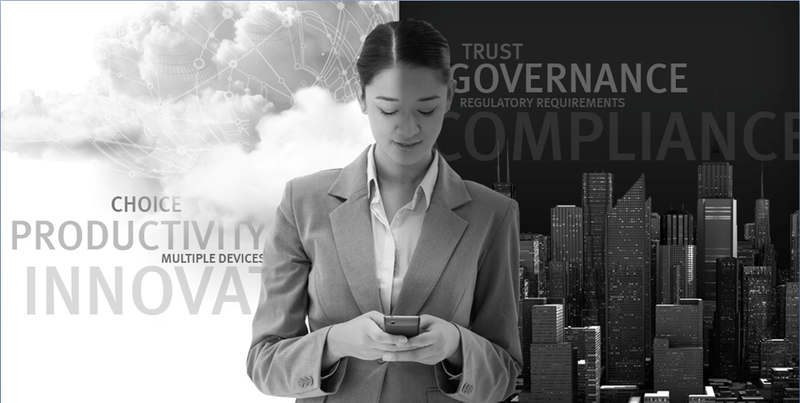 Governance and Compliance: It isn’t just keeping your organization secure, but also ensuring the right governance and compliance of the information regardless of where the information lives. Policy must follow content rather than being tied to a physical repository. Control: Sensitive and business critical information should be owned by corporations, not individuals. If a device is lost, information on that device must be controlled by the corporation. If a user decides to pursue other career options they should not be able to walk away with company sensitive information. Manageability: IT should be able to make it easier for provisioning users, accounts, and customer experiences. Rights Management: When information is shared outside corporate boundaries, organizations sharing the information shouldn’t lose control over the information. Furthermore, at any point in time, information shared with others outside the organization should have the ability to disable information based on a set of criteria. As we move into the new world where the user has taken control while IT is required to `keep the organization safe, compliant and secure, a new breed of solutions will emerge. These will be solutions that deliver superior user experiences while not ignoring the risk, safety, compliance and manageability aspects that IT so rightfully cares about. This will be a race where many will claim that they cater to this duality of needs, but only a few will be able to deliver on this promise at scale to enterprises. The challenge is harder than it sounds, but results are far greater than they seem on the surface. This is truly the new era of the content and collaboration market. Like any discontinuous innovation, the success of this will be over-estimated in the short-term but grossly under-estimated in the long term. The intersection where productivity meets trust will truly be a sea change for the content and collaboration work patterns within the enterprise. Finally, organizations won’t be forced to make a choice between two very important needs of a business – keep my users productive while keeping my organization safe. 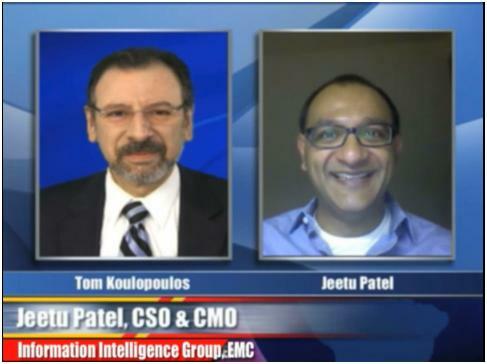 I was recently interviewed by Tom Koulopoulos, President of the Delphi Group, during the Adaptive Case Management Virtual Summit 2012 (or ACM Live) on the major forces that are shaping business today and how case management and complementary technologies can help enterprises manage this change. The replay of this interview and demo is available here. I encourage you to check it out.